Our Mountain View adventures started from several directions in the family. This picture is Ben “clogging”. Polly and/or Kit took a class at Memphis State (as it was then called) on folk music. Their professor (Jack Hurley) was into MV and owned what was to become our lot. Dad and Mom and all went up to enjoy the scene. I was away in San Diego during this, but on a trip home I caught a ride (I used to hitchhike home and back) with a sharp guy who was from the Ozarks. As we drove through miles and miles of “empty” forest, I asked him what land like this would cost. He told me about $200 an acre. That is cheap now, and it was cheap then. When I got home I asked Dad what he thought about getting a little piece of it. 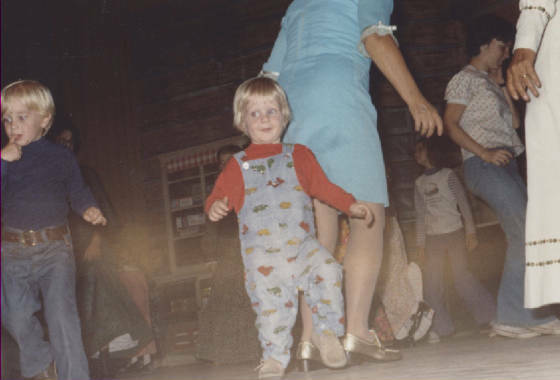 (This may have been Christmas ’71, and the music class could have been spring ’72.) Jack Hurley got in a hurry to sell his land (I’ll leave out the gossipy story), and Dad got it for about $2,000. Here is Kit and young Ben at some scenic spot. The exploring around there is a great combination of good roads and unspoiled nature. A big attraction to the Ozarks is trout fishing in the cool waters below the big dams. The most popular way to do it is “floating”. We’d rent a boat from Jack’s, get a can of corn, and just float along catching a fair amount of fish (99% of them exactly the same size, straight from the hatchery). 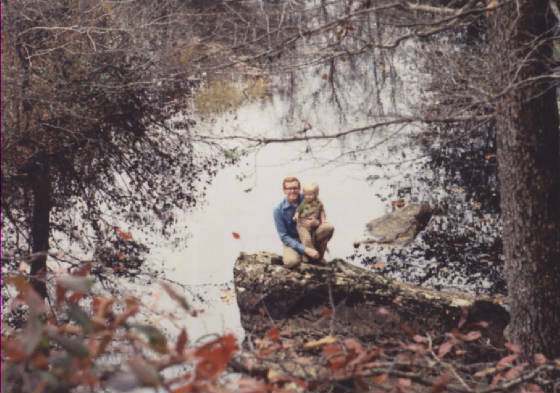 My favorite kind of places, then and now, were the small, clear creeks with massive limestone bluffs overhead. 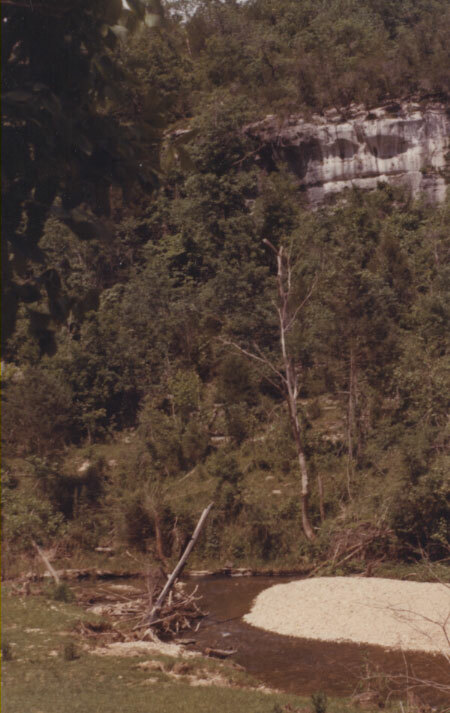 This one is “Hell creek”, which is way down in the holler east of us. 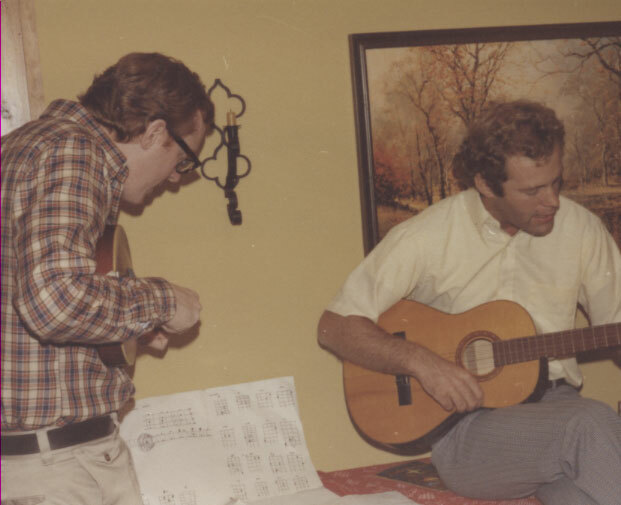 Back at home (we never did anything publicly) we had a good time trying to play the guitar and mandolin. Dad had gotten the mandolin cheap somewhere (I forget that story, but it turned out to be a pretty valuable antique), and I had just taken a guitar class and was able to make up passable chords (the chart in front of Kit). That was the era that we learned “Country Roads” for those of you who have endured it since. 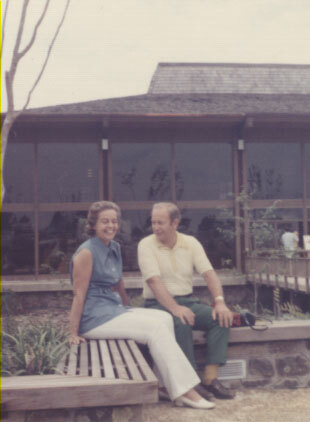 Here are Mom and Dad at the Blanchard Springs Cave. They really enjoyed the area. Just floating along the river, near Verplank’s place. You can see the water works (that is where the city gets its drinking water), which is where I go to fish and swim now. Couple of stories. 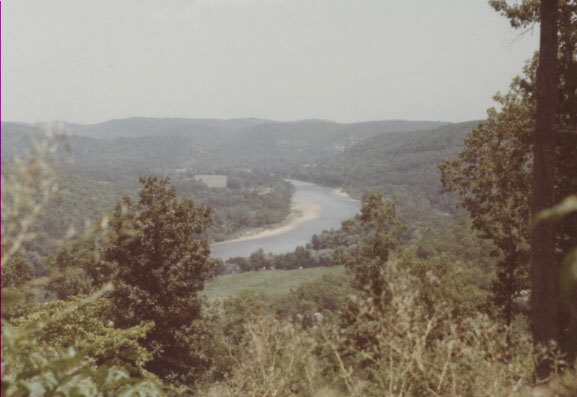 The final old shot is just of the river at some scenic overlook. Thanks for going back in time with me. One last story. Mountain View was the place where I first saw the light about pot smoking. I was not a heavy user, and by this time had seen one friend burn out, and had started to experiment with less and less. But never went too long without some, as I had a hard time turning down all the freebee tokes here and there. 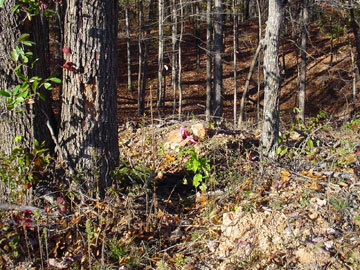 When I planted the fruit trees, I camped out in our clearing. Dad drove me up (it may have been the visit when we did the foundations) and then returned a week or two later to pick me up, take the old army tent home, etc. 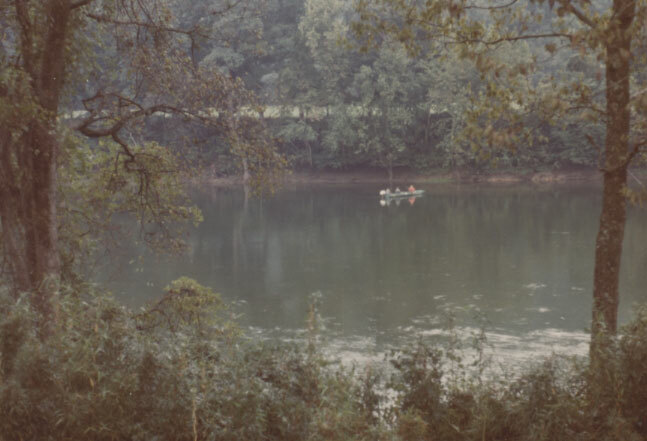 I survived on some sparse supplies (I remember a box of Bisquik, and making "hoogars"), fishing (I would walk down to the river at least once a day to fish and swim), and the occasional dinner invite from the neighbors (I remember eating a mountain of green beans that never tasted so good). One day after being there a week or so, and being "straight" for maybe a week longer than that, I was hitchhiking into town or something. Some local kids picked me up, and the three of them and I decided to go on a beer run. They knew where to go (it may have been all the way into Missouri, about an hour north) to where beer was sold. The pot story is that they offered me my first smoke in about two weeks, and it was an exceptionally good high. That caused me to think that maybe a good high comes from having a completely clear head, and increased my experimentation with longer spells with no pot in order to get a better high. And eventually just quitting. Another part of the story is one of the 3 kids was crippled from a motorcycle accident. (In the old days if you had a motorcycle wreck your crotch jammed into the handlebars and smashed your hip.) He had been loaded at the time of the accident, and here we were tooling around getting high and drunk, sort of ignoring that tragic consequence. I have always given Mountain View a little credit for my survival and getting to keep all my body parts. 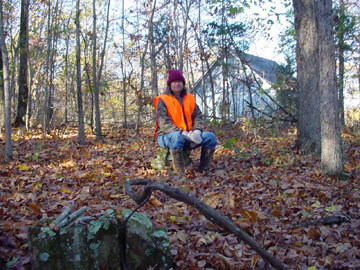 A quick jump to the present, here is neighbor Johnny sitting on one of the old foundations. 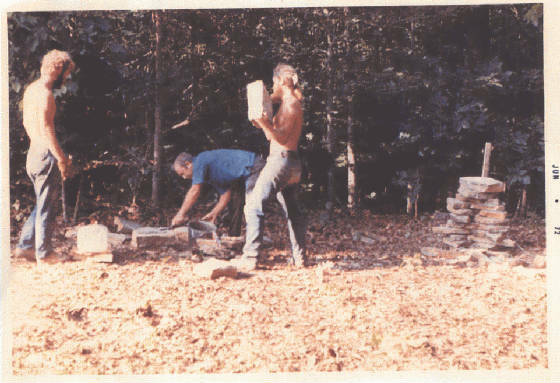 In the background is the nice house that was eventually built in the clearing, on the next lot, by Hugh Davis, and sold to Johnny fairly recently. (And note how big the trees have grown in 30 years or so.) Johnny’s house was also very close to the line. We decided to do a little land swap – he got a little breathing room next to his house, and I got a chunk of land up by the road. 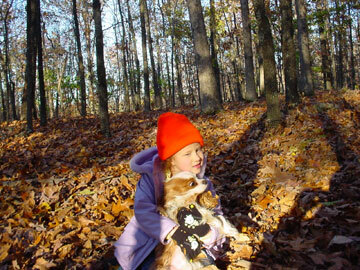 Here is Johnny’s daughter Maria playing with Hoku while we were surveying the land swap in Nov ’05. The second story needs another shot from the present day (not very clear, sorry). This is from a hillside across the river, about where we are in the one above. 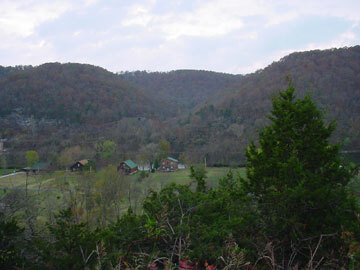 In the center background is the holler that Ruddle Rd comes down, and behind that is our back hillside. I did not realize we had a river view (it is not a great one) until the last few years when I started surveying in earnest. 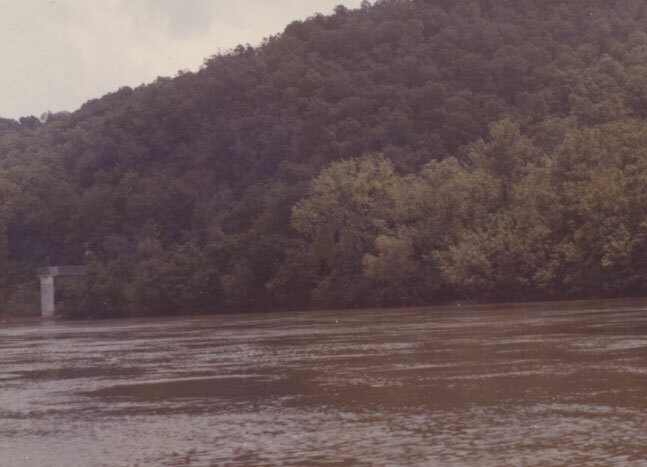 The story is that Mom somehow knew, or at least speculated that we might have such a view from that hill. When I saw that we did, my respect for her spacial abilities went up a few notches.